The Nine Stages of Alchemy take you on a journey of self-cultivation with the goal of helping you truly fly in your life and live your full potential. “The Nine Stages of Alchemy are a set of linear directions developed by the ancient Chinese Alchemists. The stages are a set of directions… telling you to go left here, right here, etc. I learned them from Dr. Jeffrey Yuen, an 88th generation Daoist priest, and then practiced them on myself and with others for many years in my clinic. I like to think of the Nine Stages as a spiritual evolution roadmap to a destination with specific directions that say… “Turn right here. Turn left here.” It’s not the only way to get to the destination, but it works. It’s a proven way to get there. The ancient Chinese Alchemists put out all the signposts for us, so why not follow those signs instead of create our own? Buddha created his own path. And that’s fine. It’s not easy or everyone would have done it by now. But if Buddha did it, anyone can theoretically do it that way. Me? I like the signposts. I like a little linearity. “First do this. Then next do this. Third do this.” These steps can be done in any order theoretically, but in this particular order, everything goes very smoothly. There’s more to life than past suffering. Letting go of the past is freedom. Alchemy is about Freedom and living Authentically. Alchemy can mean many things to many different people. But the Chinese Daoist masters believed that people are like gold—that their spirits can never tarnish and disintegrate like other base metals, such as silver. Even though most people believe we all will eventually grow old, decrepit, and die, these Chinese masters believed humans could become physically immortal! This day-long workshop will cover the foundational theory behind the Nine Stages of Alchemy. This workshop is a requirement for attendance to the Practitioner’s Day and future Practicum days. Stages 1-3 – Clear out the baggage of this lifetime and anything you brought into this life (genetics, past-lives, etc.) Release rebellious qi so that you can stop fighting for your heart’s desire and start allowing it to be easy. Stages 4-6—Change your perceptions so you can fly in your life. Metaphorically, flying is about really living your full potential. The Immortals were purported to actually fly from mountain to mountain in China. Stages 7-9 –Retreat from the world. Overcome time and space. These stages are for those who are ready to remove themselves from everyday life. The Alchemical Stages do not have time-based schedules. It is simply entering into the mystery and walking that road. It could take months, a year, or lifetimes. The process is simply a map of a path that was created by Chinese masters long ago. It may be a path you or your clients follow exactly, or you may create your own path. This day-long workshop will cover all the background information needed to start to understand how to use the Nine Stages of Alchemy in a clinical setting. This introduction day enables you to attend future Alchemical treatments as a shadower (see below). This workshop is a requirement to enable you to attend any advanced practitioner workshops, clinicals or practicum days. Each Alchemical treatment a practitioner does changes that practitioner’s own perspective on life. Doing Alchemical treatments in the way Leta does them means a dedication and devotion to the process itself, which always evokes some new realization and self-awareness. As the client changes, YOU change. Ultimately, the reason to become an alchemical healer is your own personal growth and your willingness to detach from the outcome of the client. It’s about walking alongside someone as they change and simply facilitating that change. To shadow a Treatment requires that you be an active participant in the treatment. It is a wonderful opportunity to observe an actual client receiving the treatment. Alchemy is one of the most mysterious approaches to Chinese Medicine. Leta Herman has over 12 years of clinical experience in Alchemical treatments, performing numerous treatments a week in her clinic in Massachusetts. 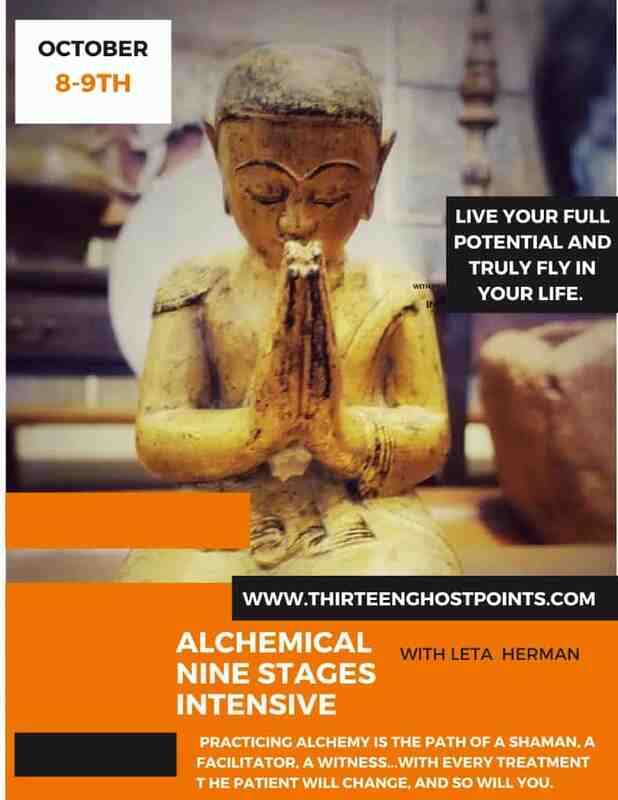 Jaye McElroy is an Alchemical Life Strategists and works with many of Leta Herman’s clients to help develop life strategies that go with Alchemy’s ability to really help people fly in their life.